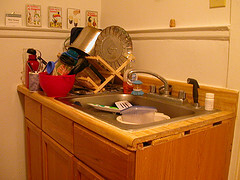 A simple rule for a clean kitchen is: Dont let the dishes sit overnight. When you wake up in the morning and see a sinkful of dirty dishes, it is a psychic drain on your energy, and it is the ultimate pressure point for kitchen. If that sink isn’t taken care of as part of your daily routine, soon you will have a kitchen full of dishes and if your dirty dishes are spread all over the counters, cleaning those off quickly will be impossible. At which point, sweeping your floors and wiping down the table at night will seem like a waste of time. AND, not to mention you are just sending out an open invite to all the disease carrying insects in the neighborhood. Believe it or not, the difference between a clean kitchen and a messy kitchen is really as simple as NOT LETTING THE DISHES SIT OVERNIGHT. It does take a little more thought and planning than just going with the 5 lb bag of junk candy, but it is so much better for the kids. Why do spots sometimes return after my carpet has been cleaned? Question: Why do spots/stains sometimes return after my carpets have been cleaned? Answer: Not to worry, this is sometimes expected. It is because of something known as “wicking” – whevever something is spilled on carpet, it ends up in the backing, So the spot that you see that is the size of a baseball is in actuality the size of a dinner plate on the underside. If the backing (where the stain really is) gets wet while cleaning it will cause the coffee, juice, etc to wick back up thru the carpet fibers and become visible again as it dries. Some carpet such as Berber, is more susceptible to this happening than others. Thesse carpet fibers hold a lot less moisture and most of it goes into the backing. That is not necessarily a bad thing – it is just easier to reactivate the spot. This is also why Berber takes longer to dry after a deep cleaning. they will be right back out to take it out! Question: Why should I hire a professional carpet cleaner when I can rent a “rug doctor” and save myself a lot of money? Answer: Because these little machines have only a fraction of the cleaning power that a truck mounted professional carpet cleaning company uses. You will NOT get the same results! Also, a professional certified carpet cleaner understands all the many different types of carpet fibers and which type of cleaning solution to use for each particular type of carpet fiber. If a solution is too alkaline, it will not completely rinse out and that leads to quicker resoiling! Also, the professional will understand what particular type of pre-treatment is needed for which type of stain. you: DONT DO IT YOURSELF! They tell you to hire a certified professional cleaner. In fact, they insist that you hire only certified carpet cleaning pros to clean their product or you will void part of your warranty! We highly recommend Sparkle Carpet and Upholstery Care for our Atlanta Maid Service customers.